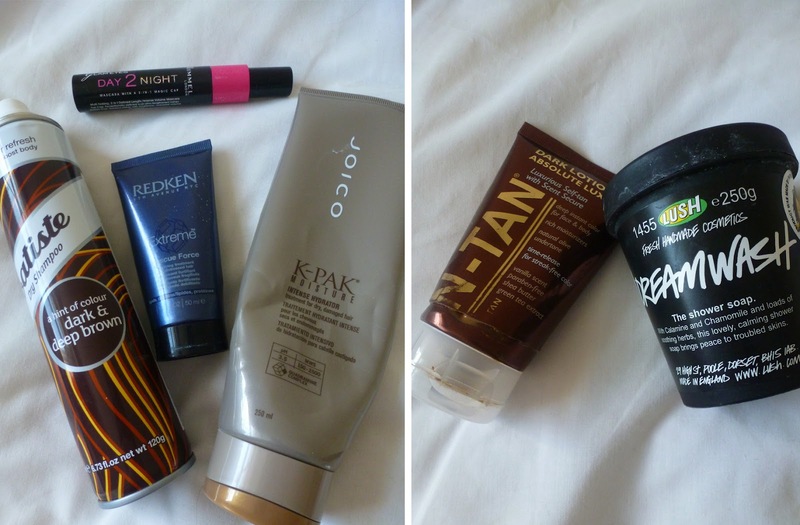 Over the month of April I have compiled this lovely bunch of packaging, not for any old reason, I have done so to show you what products I have used/loved/hated/repurchased/can't wait to throw away. Starting with hair, Batiste Dry Shampoo in Dark & Deep Brown was probably purchased by me because it was on offer and I needed a dry shampoo. Im not hugely fussy with dry shampoo whichever is on offer suits me and this did the job. I would buy it again if it was on offer, if not I would probably use something else. This sample size Redken Extreme Rescue Force (now called "strength builder" (£17.25) was given to me by my ma, It's a protein treatment for damaged hair. I was expecting this to soften and smooth my hair, but what it actually does is much more useful. This made my hair feel "strong" again. using this as a weekly treatment I have found my hair less prone to splitting and snapping off, thanks to this I am looking into more Redken Extreme products to purchase full size, let me know if you have any recommendations on that front? 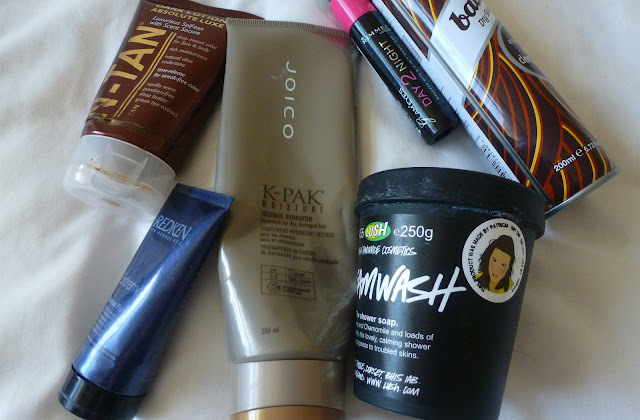 Joico K-Pak Intense Reconstructer (£13.95) is a intense moisture treatment for dry hair, this did a good job of making my hair smooth and soft but I didn't feel it had any "reconstructing" properties like the Redken treatment did. It's ok, but it's nothing to write home about, I think there are better products on the market considering the price. Rimmel Glam Eyes Day2Night Mascara (£7.99) is another one of those "because it was on offer" purchases. I think I paid a fiver for it, I fiver well spent I say. I really do like this mascara, I love the way the small comb works to separate and lengthen, then if you want volume you can add it with the 2nd step, or not. It works both ways. again, I'm not hugely fussy about mascara and I like to try new ones all the time, so while I wont be purchasing this again straight away, I would consider it in the future. Lush Dreamwash (£9.25) I wash recommended this because of my dry eczema prone skin, It's supposed to soothe and calm irritated skin and hydrate without drying. I wasn't the biggest fan of this I have to say, while it was nice and soothing and non-drying, it was plain weird. I like a shower gel that lathers up nicely and feels like it's cleaning your skin, Dreamwash doesn't lather very well and I find myself using a lot of product per use (not great when your paying almost a tenner!) It also leaves an odd waterproof type effect to the skin which I don't like, lastly it sticks around the plughole in the shower as a milky gross froth which, quite honestly, freaks me out. On a better note, to replace this, I'm now using Lush's Honey I washed the Kids soap and It's Raining men shower gel which I both love! I love Batiste dry shampoo! Hmm.. you have got cool collection of cosmetics. Great!